The trick to making this recipe is not to read ahead. Or, if you accidentally glance across, to immediately forget what you saw and concentrate on the particular task at hand. In fact it's a lot like renovating; a topic which is particularly relevant to my life at the moment. Renos, as we like to call them in this part of the world (you need to say the word with a bit of a twang and elongate the 'o' as in 'owe'z'), in my experience, can only be coped with by compartmentalising. If you thought about it all at once then you'd never start. Of course, if you're an Alpha Baker and/or baking the cake because you promised it for a fundraising event, then you really do have to start. And so I did, with a bit of adjustment (I just couldn't face the sugar syrup part of the Italian meringue). 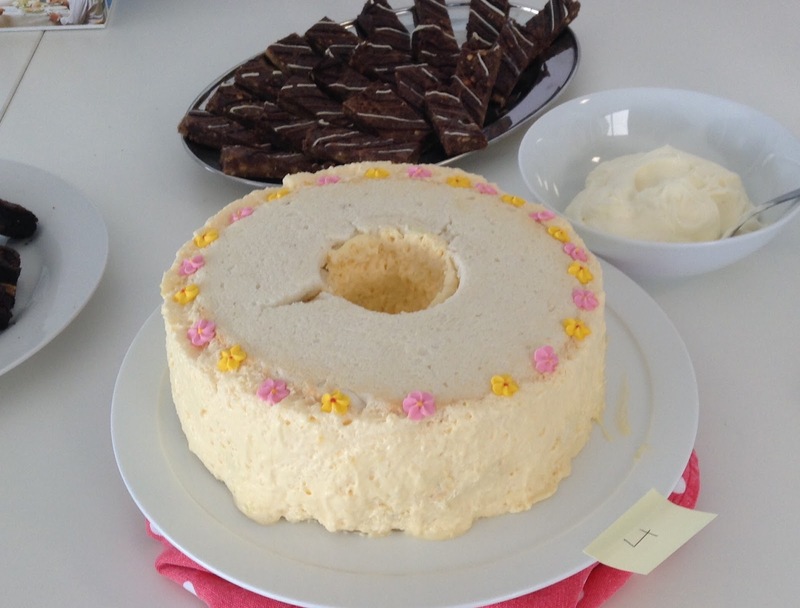 My version of the Lemon Icebox Cake in the photo below doesn't look too bad if you overlook the twee decorations (my five year old self popping out again for a bit of decorating). And it was delicious, and surprisingly light and refreshing, particularly given the enormous number of eggs and oodles of cream. 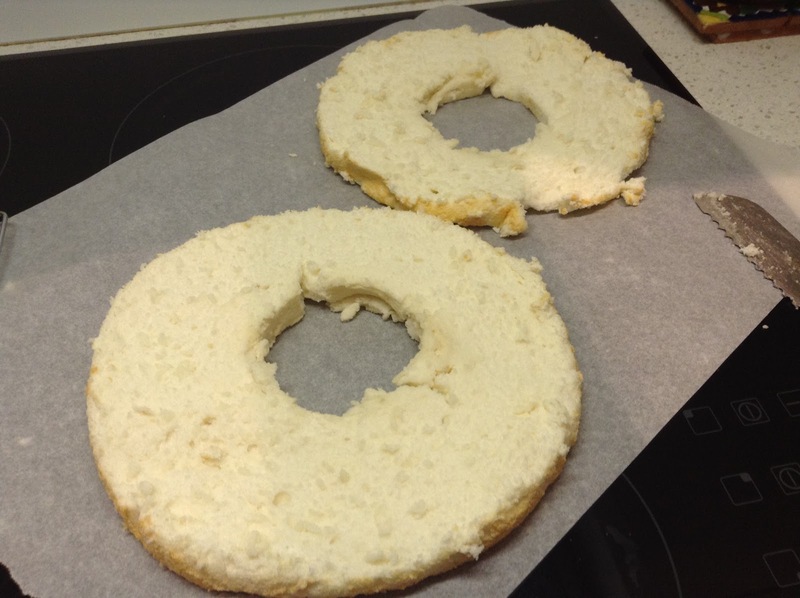 Unfortunately the angel food cake part of it failed badly, although I did manage to resurrect enough to construct a finished product. Luckily the lemon curd cream held it all together. *That crack in the top really annoys me. If I'd had any icing sugar on me at the time I would have dusted over it. Cue elevator music...lulling the cook and her readers into a false sense of calm. 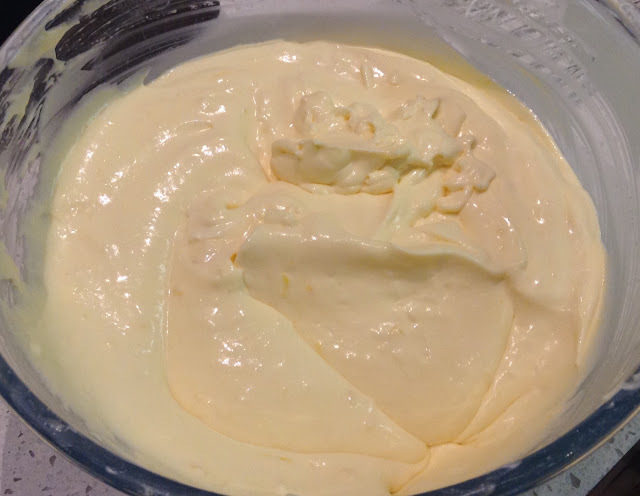 There are quite a few steps to making the lemon curd meringue cream and one of them involves making Italian meringue by drizzling hot sugar syrup into beaten egg whites. Somehow that seemed too much, so after a bit of research I decided just to make a plain meringue mixture by adding sugar to the beaten eggs. 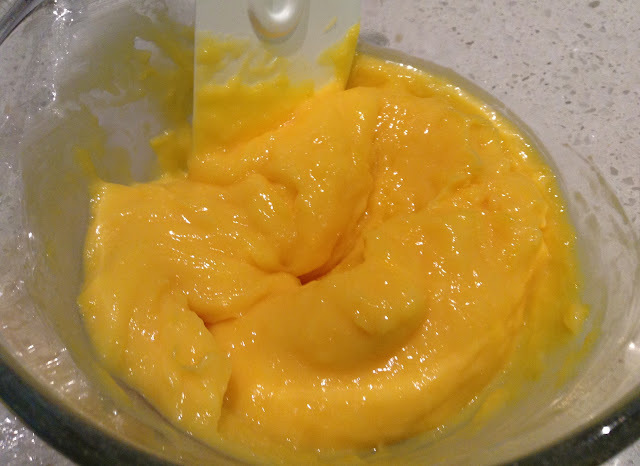 The first step, however, was to make the lemon curd. It was a very easy method to make curd. All it needed was a little patience while stirring the mixture to thicken. I love, love, love the colour the curd comes out and this time I managed to catch it properly with the camera. The next day, before I made the angel food cake, I folded whipped cream into the curd. The mixture was absolutely delicious. You could just serve it with spoons. 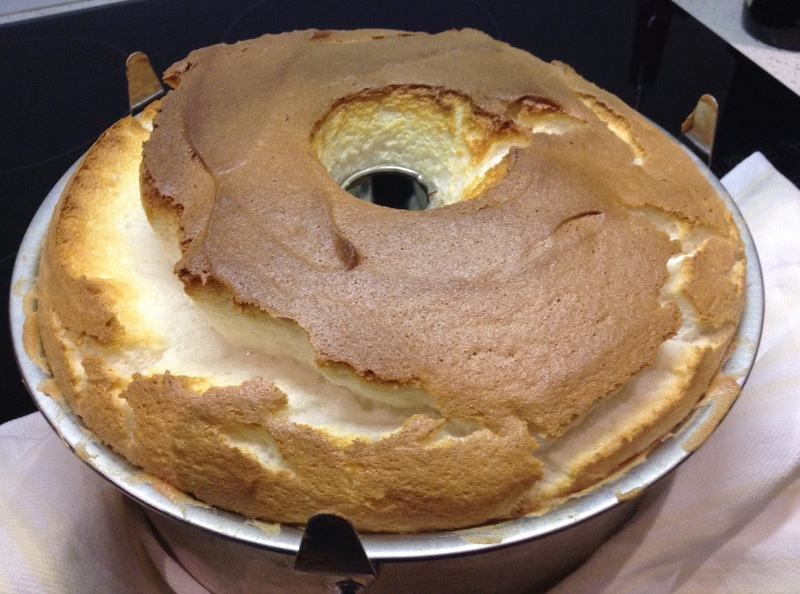 Then, the ill-fated angel food cake. There was nothing particularly difficult in the making of it. It has an extraordinary amount of egg whites in it. The recipe specifies 16! Yes, that's right, I said 16! I used the weight given in the recipe and it only turned out to be 13 egg whites. I'm wondering if that contributed to my problems with this cake? The recipe has us add two teaspoons of cream of tartar to the beaten egg whites which I was doubtful about but put in anyway. The taste of the eggs was pretty awful with that much cream of tartar until I added the lemon juice and vanilla. I think it's meant to make the cake white, which to my eyes looks strange anyway, so I won't be adding that much again. You can see the cake was very cracked when it came out of the oven. The skewer came out clean so I thought it was done. The last sentence is written in a language known only to cooks. It is impossible to translate it directly to English. But you get the gist. For those not familiar with making angel food cake, it needs be suspended upside down in the baking tin to cool. The tin has a hole in the middle which allows you to balance it on a bottle with a thin neck. It's a bit nerve-wracking turning a hot cake upside-down but up until now I haven't had one fall out. 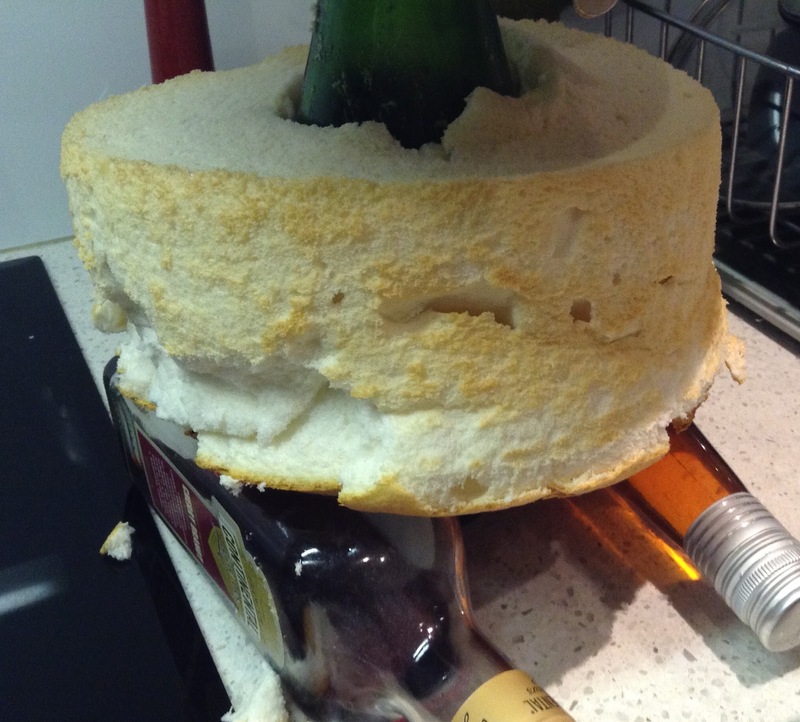 You may be mystified by the bottles under the cake but they were stabilising the bottle I used to elevate the cake tin. Stability of the bottle turned out to be the least of my problems. Stupid cake. The recipe requires two slices of the cake to be cut crosswise. I managed to cut two thin circles off the cake by some miracle (it collapsed even more than the photo above shows). I'll spare you the photo of the rest of the cake. Lucky the recipe called for it to be broken into little pieces which wasn't a long way from where it was already. Lucky there was miracle glue in the form of lemon curd cream. 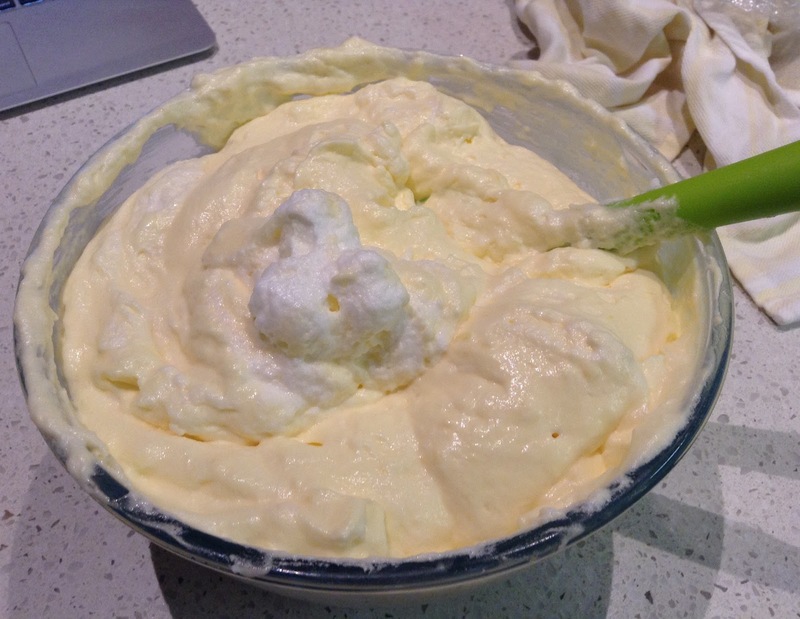 Just before putting it all together I folded egg whites* beaten with sugar to make a plain meringue, into the lemon curd cream mixture. I'm not that fond of a jellied texture in cakes and desserts but I could see that I would need something to hold this together, particularly in the hot weather here. So I added a leaf of gelatin (I prefer leaf gelatin because I think it gives a softer hold) and then I panicked and added another one. The texture of the final dessert wasn't at all jelly-like so one thing worked out well, at least. This coming week we're making Pecan Praline Scheherazades. Sure looks pretty! Totally agree with you about needing Marie back stateside to stay up to speed with baking. The lemon curd looks so good and the combo with the whipped cream sound delicious. Your resulting cake looks so pretty!